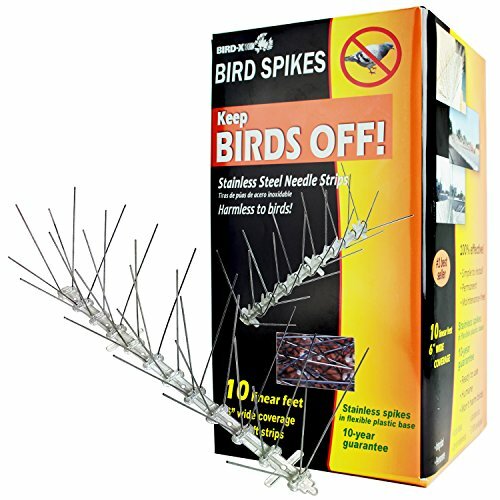 These birds spikes are an excellent strategy for keeping birds from roosting in areas you do not want them. This scareowl is an incredibly simple method for keeping birds away. Scare tape is great for scattering across your property. The only downside is that it fades quickly. Birds may not be one of the most common hazards you experience around the house, but they can become an issue in gardens and patios if there are too many. Bird droppings are unsightly on a nicely maintained driveway, and they also eat seeds from your garden. Over time we have shifted away from some of the traditional methods of scaring away birds like scarecrows and traps. Now we do not have to harm birds to keep them away from our home. In this article, we are taking a look at some of the best bird deterrents of 2018. This strategy for keeping birds out of your yard is incredibly useful and harmless to the birds themselves. With these spikes, you get ten feet of coverage, and you never have to think about it again. These are stainless steel, so all you need to do is set them up on an area where you do not want birds to perch. This product is ideal when placed around the perimeter of an area that you need to keep clean and free of bird droppings. This is an advancement on the traditional scarecrow. 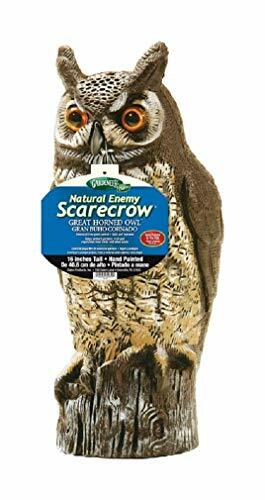 Unlike a regular scarecrow, this owl is a known enemy of most birds and will quickly scare them away from gardens, patios, and outdoor living areas. 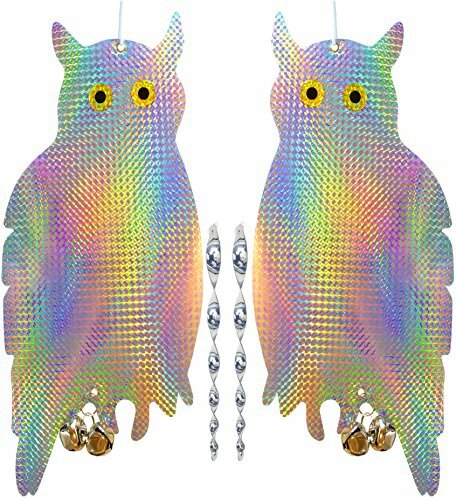 The owl gets made of durable plastic, and each one is hand painted in the USA for realism. This scare owl is very lifelike and incredibly effective at scaring away birds from fruits and vegetables. The goal of this tape is to keep birds off your property, and this tape is a favorite product with farmers who have a lot of crops to protect. 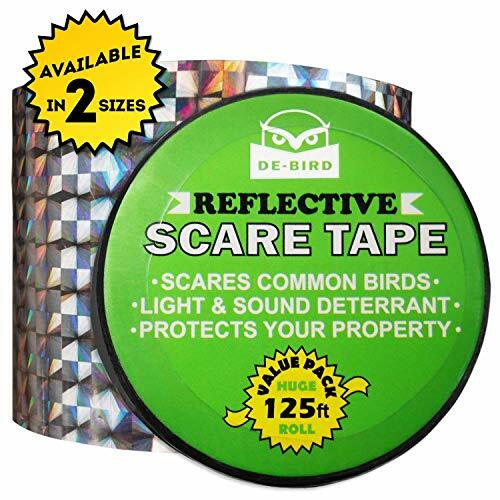 The tape is reflective and deters birds from roosting around your property. The manufacturer recommends wrapping the tape around tree branches, railings, and fences wherever you are trying to keep birds away. The tape has a bright diamond design on it that reflects the sunlight and also makes a rustling sound in the wind for additional repelling ability. The best thing about this repellent is that it’s utterly harmless to the birds. It keeps them away and keeps you happy. This device is incredibly effective because it combines all the best repellents into one product. The holographic repellent combines sight, sound, and light in one to scare away any bird from your property. The sunlight reflects off the owl creating a bright light which scares away the birds. In addition to the light, the graphics have bells and rods on them that make noise in the wind. This product is completely harmless to the birds, and its only purpose is to scare them away, so they do not defecate on your property or eat your seeds. The entire product is made of all non-toxic materials and causes absolutely no harm to any wildlife. The manufacturer also offers a 100% money back guarantee if you are not happy with the product. This simple and cheap solution is excellent at keeping birds off of your property and away from your valuables. 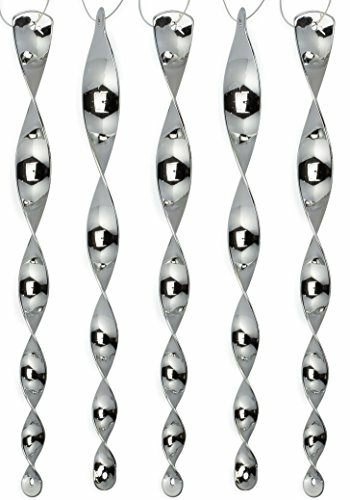 You hang these around your property from branches or beams, and when the wind blows them, they swing around and create a bright reflection that scares birds away. In addition to scaring birds away, these can be left up all the time because they are nice to look at. This is an effective solution for keeping birds out of gardens or yards where you do not want to deal with bird droppings. When trying to scare away any pest, there are always a bunch of factors that come into play. Luckily, when it comes to scaring birds away, there are very little harmful products on the market and none that we would recommend, so you do not have to worry about that. Every individual situation is different so let’s break down what might cause you to choose one deterrent over the other. If you are anything like us-we like a simple product that is easy to use. It is bad enough that you are dealing with an issue already, the last thing you want is to spend hours setting something up and additional hours maintaining it. Most bird deterrents are simple and require very little maintenance over time, but that is not true for all of them. You want to go for a reflective device if you are looking for something that is simple. Reflective devices are as simple as setting them up and forgetting about them. They are going to work even when you are not around to consistently scare birds away. Reflective devices also do not require any maintenance over time. They last a few years and then they need to get replaced. You want, a deterrent that is going to work better than any other one. You want the most effective one you can buy, so it’s important that you check out reviews and get recommendations from people who have already tried the product. Often the most effective products are the simplest ones that get you from point A to point B the fastest. We are preaching simply here. You could spend a ton of money on a fogger or other repellent type product that may never work and requires a lot of maintenance, or you could go from a reflective device that you set up and forget. Another huge factor to consider when getting a bird deterrent is how long it will last. You do not want something that is going to become ineffective within a few days or weeks. Some reflective devices fade over time, and once that happens, they lose their effectiveness. When checking out reviews and deciding on a deterrent, you want to pay attention to the reviews that tell you the product has lasted over time. When it comes to keeping birds away from your crops, you do not want to forget about the device and come home one day to all your seeds gone, and your crops have bird droppings all over them. Do not waste your time on a product that will not last you at least a few months. When it comes to birds not all of them are harmful to your property. There are a few classifications of birds that you do not want to find in your garden though. Let’s check those out. Rutgers Cooperative Extension did a study on blackbirds, and the effect they can have on a healthy garden. Blackbirds, as well as cowbirds, grackles, and starlings eat small insects, but they also eat all your seeds and vegetables like lettuce and tomatoes. If you find an abundance of blackbirds in your garden, you want to establish a strategy for getting them out immediately. These birds are most beneficial to us, but they can still be harmful to a garden. Like blackbirds, they also eat your seeds and vegetables. You do not want crows in your garden either. In this article, we have shared a variety of simple methods for keeping birds out of your garden. In addition to these strategies, there are some other less ethical ways to keep birds away. We do not recommend trying any of these on your property. Often this method is recommended for keeping birds out of the garden, but we are not fans of this because birds can get stuck in the screen and become strangled or trapped. Similar to the previous method birds become entangled in the netting, and this becomes a larger issue because they can rustle around enough actually to harm your crops as well as themselves. There are many different chemicals out there that can be sprayed onto your crops or included in the soil mixture that keep birds away. Most of the time this is harmless to the birds because it repels them and makes them not want the seeds. This does become a hazard if the birds consume contaminated crops. We never recommend chemicals as a solution.